We were extremely excited to have graphic designer and surfer, David Carson, in the shop today to talk about his life as a surfer and graphic designer. David grew up in Cocoa Beach, Florida where he started riding waves, then eventually becomes a professional surfer and shares his experiences both competing and judging contests in the late 1970s and 80s. As his professional surfing career started to wind down, David became intently interested in his second passion - graphic design. The rest is really history as David then becomes one of the most famous designers in the world. Apple named him as one of the most influential designers of our lifetime through his work at Transworld Skateboarding, Surfer Magazine, Beach Culture, Ray Gun, and others to name a few. So that's where we dive in, but before long we're able to peddle back and get into the beginnings of David's surf career and his ultimate passion for graphic design. 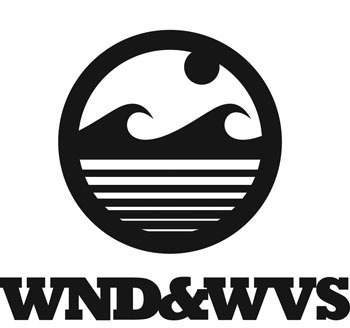 I hope you enjoy the show and as always, be sure to check us out at wndnwvs.com for all your surf apparel and gear. Meet Samantha Bittner. Born and raised in Washington state, moved to Maui out of a passion for windsurfing and soon after created the American Windsurfing Tour. Hear her story as she pumps new energy into windsurfing by re-introducing wave sailing to the Americas. Russ and the boys get Chuck Patterson on the line to talk about stand up paddle surfing at Jaws this winter and the need for a single world racing/surf tour. The WND&WVS crew sits down to talk with Mavericks founder and big wave surfer, Jeff Clark, about his latest custom stand up paddle surf and race shapes and the SUP scene in Northern California. Russ, Kevin, and Jeff had the opportunity to talk with Laird Hamilton about his recent hip replacement surgery, foil boarding, the 2016 Surrator, and this winter's El Nino season.